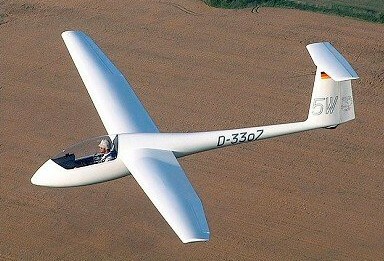 The G-102 Astir is a single seat glassfibre Standard Class sailplane, designed by Burkhart Grob. 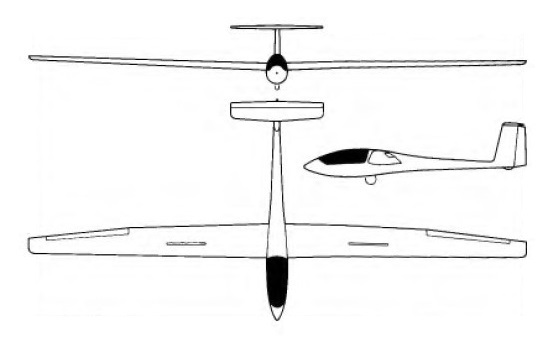 It was the first Grob-designed sailplane. Construction of the prototype Astir CS began in March 1974. It features composite (fiberglass/resin) construction, a large wing area, a T-tail and water ballast. A Standard Class Sailplane, the large wing area gives good low speed handling characteristics. The main gear retracts. It first flew on 19 December 1974 and it went into production in July 1975 and soon proved to be popular, a total of 534 being delivered. The cantilever mid wings have glassfibre roving main spars and a glassfibre/epoxy resin sandwich skin except for the ailerons, which are of glassfibre sandwich. There are Schempp-Hirth aluminium air brakes in the wing upper surfaces, but no flaps, and up to 220lb of water ballast can be carried in tanks in the wings, being jettisoned via a dump valve in the fuselage. Rigging is carried out without any separate removable parts as the wings and the tailplane are attached by a system of 'snaplock' connectors. The glassfibre semi-monocoque fuselage has a towing/launching hook, and the large one-piece cockpit canopy opens sideways to starboard. Construction of the T-tail unit is the same as that of the wings. This was followed by the Club II with similar fixed gear. A slightly improved version, the CS-77, was introduced in 1977. The CS-77 has a different rudder profile fuselage similar to that of the Speed Astir. The Astir CS 77 made its first flight on 26 March 1977; nearly 400 of the CS 77 and Club Astir had been built by the end of 1978. The Club Astir II and the Standard Astir II featured the new fuselage of the Speed Astir II. with a one piece canopy, as well as the elasticated flaps of the Speed version and a new wing tip profile. The Astir CS 77 has a retractable monowheel with an internally-expanding drum brake located ahead of the center of gravity, which folds up behind closed doors, and there is also a rubber-sprung tail wheel. The Astir CSM was a powered version under development in mid-1976 with a 25hp Fichtel & Sachs Wankel KM24 rotating piston engine on a retractable pylon aft of the pilot, driving a two-blade Hoffman tractor propeller. A 6.6 gal fuel tank is fitted. The Astir CS Jeans was of similar configuration to the CS 77, but with fixed wheel, and a tailskid. The Standard III followed in the early 1980’s reverting to the higher profile fuselage and with reduced empty weight and increased payload. The Club III has a fixed main gear ahead of the center of gravity, and a tailwheel. The Club IIIB has a cockpit almost identical to the front seat of the two-place G 103 Twin II with a fixed main gear aft of the center of gravity and a nosewheel. Air Transport Certified (except Club II which is EXP). One, flown by R.R. Harris of the U.S., won the world absolute altitude record at 14.938 m/ 49.009 ft in 1986. Production variants were the Club Astir III, IIIB and Standard Astir III, which have a roomier cockpit and reduced empty weight.